I can’t tell you how many times I’ve had a client (or a friend) ask me… but what about fat? Shouldn’t I be cutting it out of my diet? I once asked the same question before I was made aware of the simple fact that our body needs fat. For far to long fat has been blamed as the culprit in creating an epidemic of heart disease, diabetes and obesity. In fact. The real baddie is sugar. What I am saying is being talked about widely in the health industry and now starting to filter down into the masses. I have come to realise though that the everyday person still thinks fat is bad yet seems to overlook sugar – nasty piece of work that it is! Back in the day sugar was vital for energy and fuel storage. With little naturally occuring sugar other than fruits and berries available we slowly evolved to a state where our bodies disregard the quantity of sugar we were ingesting. This was vital to survival because when we next ate another good quality meal (meat from animals etc) was anyone’s guess. Today, in the scheme of time, is not that far along from this way of living. So, we still don’t have that sugar switch off. We don’t know when to stop! And, to top it off, we also now have incredibly refined versions of sugar added to almost anything! In fact, we take OUT the good stuff in wholefoods and replace it with sugar and then call it fat-free. Yes. This makes me angry. So much so that I’m dropping the sugar argument right there and moving on to a happier topic. Yummy, delicious, grounding, nourishing FATS. Particularly saturated fat. Oooh, that heart-clogging evil doer! If you were going to be honest with yourself you might admit that nothing is more satisfying that cooking with butter, or eating the creamiest avocado dip, a slice of soft cheese, oily salmon, or a juicy piece of (grass-fed!) lamb. Or actually, maybe you are gagging at the thought because you’ve been conditioned to avoid fats – living a ‘fat-free’ life yet wondering why you are always tired, sick, weak and flat!? Let me help you see things differently. I read a book by Nina Planck who started the farmer’s markets in the UK. She was a fat-free vegetarian. She was overweight, sick, and always lacking in energy. Over time she started injecting good quality fats and animal products back into her life and what happened? She lost weight, naturally became healthier, immune system strengthened, energy increased. You get the picture. I’ve read this and seen this countless times. I am in no way advocating a diet of greasy kebabs and ‘fatty’ foods. There is a difference! I am just encouraging you to see that good fats are vital in our die. Fats make up half of all cell membranes – it’s structurally vital! Fats supply our bodies with a source of energy throughout the whole day – ever noticed how eggs, or cheese or something oil based makes you feel fuller for longer? We tend to crave more stodgy, carby food for energy which can often lead to get blood sugar fluctuations that can send us on a see-saw! 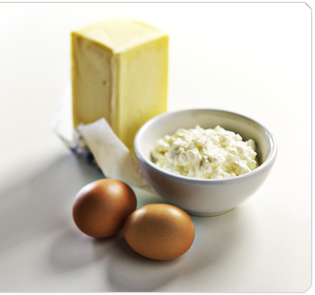 Fat in classic wholefoods – raw milk, eggs, meat, fish – are combined with protein. Together they create a complete food. The fat assists in the protein digestion, mineral absorption and creating a soluble environment for the fat-soluble vitamins. So, egg white omelets are a low-quality, incomplete meal because the fat and protein that exist in a whole egg are married together for a reason. So what do you get from food that fat is essential in ensuring your body uses it in the right way? Vitamins – A, D, E K are fat soluble. If your food has these vitamins and you aren’t including any fat then you won’t absorb these vital vitamins. If you are vegetarian, butter and eggs are vital to your health. This is difficult if you are a vegan – there will be a considerable lack of Vitamin A (which the body struggles to make from other sources) in your system. Last but not least – if you are eating meat opt for grass-fed animal products. Dairy – raw, whole and locally produces, Fish – preferably not farmed and eggs – pastured. That being said go ahead, feel good about eating high-quality fats and know that by choosing the absolute best quality, you are protecting and nourishing your body. What is your brand of balance?